Over 50 per cent of holiday cottage searches in the UK are requests for pet friendly breaks. That may seem a fairly obviously statistic: holiday rentals are typically the most common accommodation to welcome dogs along with their owners. It’s no surprise then that there’s no shortage of cottages that welcome dogs, but they do vary in the facilities that they provide for your canine companion. So when it comes to packing your suitcase, leave a bit of room for Fido’s things. Alternatively, pack a bag all of their own – just don’t let it take up more room in the boot than yours! However well trained your dog is, there are parks and beaches that specifically require dogs to be kept on leads. So even if you don’t normally use a lead for dog walking, best pack one just in case. And if your loveable mutt is used to being set free, an 8m extendable lead is probably the best place to start. Whatever you do, don’t forget their food. If you’ve arranged for a supermarket home delivery service to meet you at the cottage, unless you have a small dog, it’s unlikely they’ll cater for dogs beyond dentasticks and treats. Looking to save room in the car? Research local pet food stores in the vicinity of where you’re staying and check if they stock your pooch’s preferred kibble. It’s also a great way to support local businesses during your stay. Food and water bowls. Some of the most pet friendly cottages will provide these, but like kids, dogs can be fussy about what they eat and where they eat it from. And a couple of bowls won’t impact the boot space, so pop them in regardless. If you’re going to be in the car for a few hours, there are some fairly functional water bottles on the market that come with inbuilt dispensers/drinking trays. These are relatively easy for most size dogs to drink from and waste less water than filling up their usual water bowl then having to tip away the excess. Towels. Dog walking at this time of year is rarely puddle or mud free. And chances are that if you’re heading to a rural retreat with man’s best friend you’ll take the opportunity to go off the beaten track and enjoy someone else’s bucolic scenario. So just in case your cosy cottage isn’t equipped with a boot room, take an armful of towels to dry off the dog after your morning stroll. If your mutt gets matted fur or needs some assistance ditching the dried mud from its tummy, find some room for their brush or other grooming tools. After all, even the dog likes to look preened whilst on holiday! Toys. Balls, tugs ropes, squeaky stuffed animals. Whatever your dog’s toy of choice, make sure it travels with you. Best it cleans its teeth on something you own rather than the lovely cottage’s leather armchair. Depending how fussy or pampered your pooch is will determine whether or not you need to take a bed for them. Hardier breeds like Alaskan Malamutes are typically happiest on the coldest surface they can find. Whereas some gallant but bony Irish Wolf Hounds we know simply can’t be anywhere other than their massive, squishy beds. 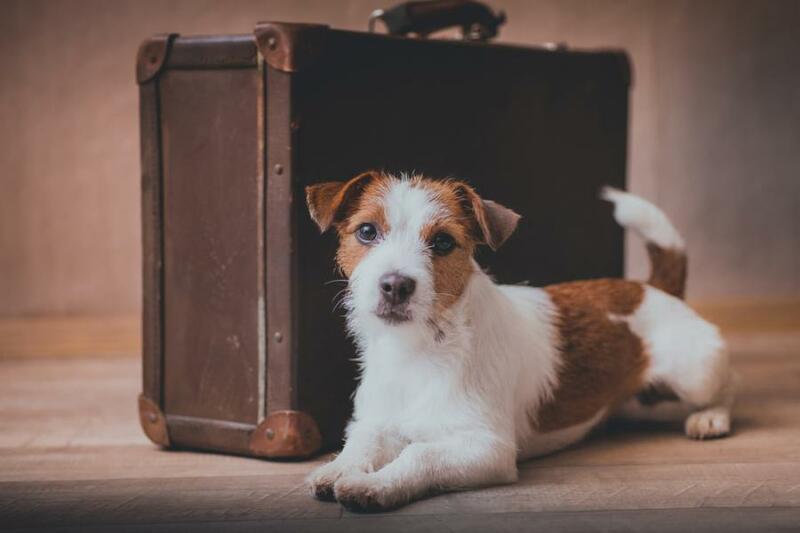 For those of you with smaller breeds, we came across these suitcase beds – a quirky take on reusing a vintage suitcase and providing the ultimate comfort factor for the woof in your life. Pack the poo bags. You don’t need us to nag you about scooping the poop. It just has to be done. Otherwise you’ll be grooming the soles of your precious Hunter wellies or Dubarry boots too. You don’t want to cause a mass exit from the village pub post walk now do you. Before you head off on your holiday, check with the property manager if there are any walking guides or books in the cottage. Typically, you’ll find a guest handbook brimming with info on local attractions, sites of interest and local paths or trails. Happy dog walking!